We can convert String to char in java using charAt() method of String class. The charAt() method returns a single character only. To get all characters, you can use loop. 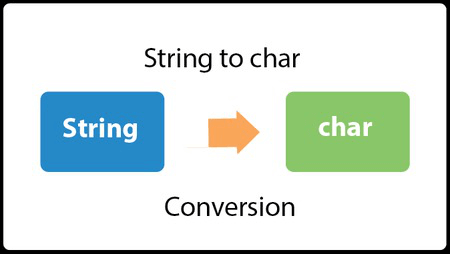 Let's see the simple code to convert String to char in java using charAt() method. Let's see the simple example of converting String to char in java. Let's see another example to convert all characters of a string into character. Let's see the simple code to convert String to char in java using toCharArray() method. The toCharArray() method of String class converts this string into character array.